"Shed no more tears, my son. From this day forward we shed only the blood of our enemies." Hong Kong superstar Jet Li first came to attention in the West with his role as the villian in Lethal Weapon 4, which without Li's performance left little else to be said for it. In his homeland, Li made his first film at the age of nineteen, The Shaolin Temple, which apparently sparked a martial arts craze. Another in a string of Shaolin-themed martial arts extravaganzas, Hong Xiguan zhi Shaolin wu zu aka New Legend of Shaolin aka The Legend of the Red Dragon pits Li against an army of enemy soldiers out for his head as a spear wielding Shaolin master. Our lead character, Hung Hey Kwun (Li), returns home to find his family and village slaughtered by the new Manchu government. As he wades through the bodies impaled inside his house, he discovers his infant son Ting has survived. He plants his sword in the floorboards, issuing a challenge to the toddler: if he chooses his favorite toy he will be executed and sent to hell to be with his mother; if he chooses the sword, he will fight alongside his father in a bloody mission of vengeance. Ting chooses the sword, but before the pair can leave on their quest, one of Kwun's schoolmates at the Shaolin Academy arrives to betray Kwun for the bounty on his head. A furious martial arts battle ensues, with Kwun using his trusty spear against his opponent, and of course, just when he looks to be beaten, he delivers the master stroke, impaling his foe and leaving him to die. But he doesn't...Years have passed as Kwun and his son have been roaming the countryside, just one step ahead of those after them. With spies everywhere, the new government is looking for the map that holds the secret to an ancient Shaolin treasure. In a new town, Kwun and Ting are hired as bodyguards for a local merchant, whose son is one of five boys chosen by the monks at the local Shaolin monastery to have parts of the map tattooed on their backs. The merchant has also just acquired a new bride-to-be, a young woman named Red Bean, who along with her mother—who pretends she is dead to garner sympathy and donations from strangers—are notorious con artists out for his money. Kwun has just become their number one obstacle. If that isn't bad enough, Kwun's long-lost mortal enemy returns, resurrected with the help of a little witchcraft that makes him invincible. However, Kwun and son will not be deterred, and those who oppose them had better be sharp, or they won't survive the ex-spear-ience. Anyone looking for a serious martial arts film can quit reading right now—this is a farce of epic proportions. The fight sequences are completely over-the-top, with highly accelerated action, copious amounts of wire work, and magnificently choreographed moves. I began cringing when the first line was spoken in English—this is a Cantonese film after all, available in its original language on DVD as New Legend of Shaolin from Tai Seng—but the bad dub only adds to the comedy. Li's dialogue is done to match the lip flaps, which results in it being extremely and unnaturally fragmented, making William Shatner look like a fluid actor! The fact that many of the fight sequences involve the midget brigade of the Shaolin students also lends a great deal of humor, and we have the mother/daughter con team upping the ante. The Legend of the Red Dragon isn't going to win any awards for great scripting or decent acting, but as an insane martial arts flick, it makes for mindless popcorn fare. Image Transfer Review: Despite the cover's warning that the film has been modified from its original aspect ratio to fit your TV, The Legend of the Red Dragon is presented in nonanamorphic 1.85:1. The image is generally fine, while containing a fair amount of minor dust and dirt throughout. Colors are reasonably vibrant, and black levels are fairly true, though some scenes seem overly dark. Compression issues are minor. It isn't a bad transfer by any means, but this is another in a long line of Hong Kong flicks that make their way to North America with little extra attention to presentation. Audio Transfer Review: Two English dub tracks are the only available options, one in stereo surround, the other in 5.1 Dolby Digital. Both feature discernable, if fractured, dialogue, and the score and foley effects make good use of the directional fields. The tonal balance is fine, with some good use of the low end. Aside from the corny voiceover, nothing to complain about here. Extras Review: Extras contain a full-frame trailer, filmographies for the director and major stars, plus trailers for Jackie Chan's The Prisoner and Gorgeous, Jet Li's Meltdown and Crouching Tiger, Hidden Dragon. The cover suggests this is "an epic story of a man who challenged the limits of courage and fought for the heart of a nation," which is pouring it on as thick as the level of self-mockery contained herein. 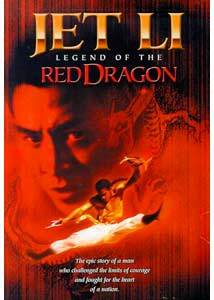 The Legend of the Red Dragon is a wacked out, kung fu on speed, comicfest, and any resemblence to a serious film had to be an accident. Don't expect to come away with any new wisdom, Grasshopper; this one is strictly for those with a taste for high flying, martial arts combat laced with a good dose of silliness.